Civil War-era vampire Stefan Salvatore may be calm, cool and collected when it comes to the ladies, but the actor who plays him on “The Vampire Diaries,” Jersey boy Paul Wesley, admits to being anything but. Take one of his earliest crushes – a 12-year-old classmate in Marlboro (Monmouth County), NJ. In a move designed to be “super romantic” and “super suave,” Paul copped his dad’s credit card and ordered the biggest, most elaborate bouquet available for his lady love. Trouble ensued when the florist included his father’s name on the card. It’s a little embarrassing to admit I lust after enjoy watching the men of “The Vampire Diaries” as much as I do. "The Vampire Diaries" is the kind of show that keeps on giving. Yet, like George Washington, I cannot tell a lie. 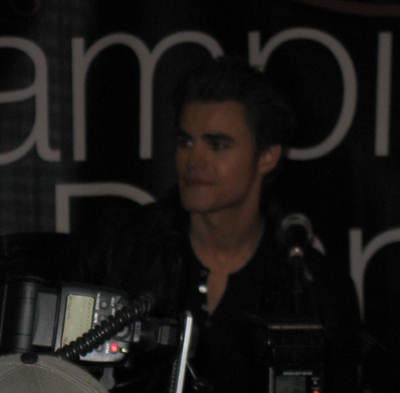 Week after week, the finely chiseled jawline of Paul Wesley (a Jersey boy, holla!) 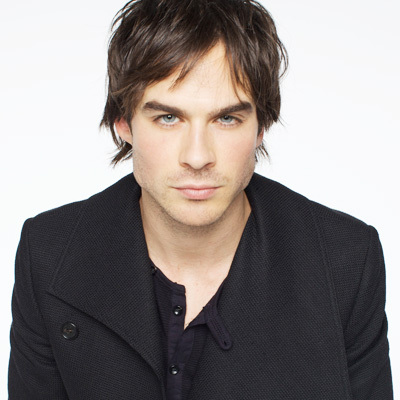 and the mesmerizing baby blues of Ian Somerhalder – not to mention their oh-so-hawt bods – make me weak in the knees. And what’s wrong with that? Absolutely nothing… except that the bods in question belong to guys just a bit younger than cute lil’ me. I learned a few things about the cast of “The Vampire Diaries” yesterday that I didn’t know. First – and most importantly – Paul Wesley, who plays *good* brother vampire Stefan, is a Jersey boy. While one of the some 500+ fans gathered at the mall told me she thought he was from Cherry Hill, the truth is – according to IMDB and Wikipedia – Paul is another Marlboro celebrity. (He joins the Hayes family from TLC’s “Table for 12.”) He was born in New Brunswick (as was I, albeit a *few* years earlier) and reportedly attended Rutgers (ditto) for one semester before leaving to pursue acting. I also learned that Paul, who plays *good* boy vampire Stefan, is a big fan of a certain kooky reporter from Kazakhstan. “Paul does the best ‘Borat’ impression ever!” revealed Nina. 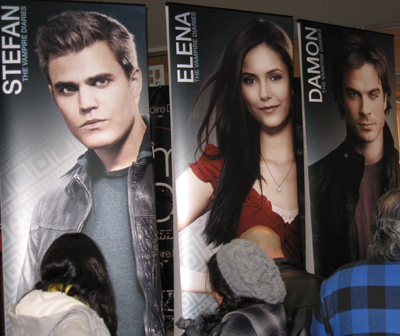 Fans had an overall better view of these posters (for a good five hours or more) than they did of the "Vampire Diaries" stars. As for Ian (he of the piercing baby-blue eyes), who plays oh-so-bad-boy vampire Damon (Stefan’s older brother), he confirmed that he will return to his roots as the ill-fated (or maybe not so ill-fated?) Boone on the new – and final – season of “Lost,” which kicks off at 9 p.m. Tuesday, Feb. 2, on ABC. I bet Nina - sandwiched between Ian on her left and Paul on her right - was the envy of every single female in the mall yesterday. 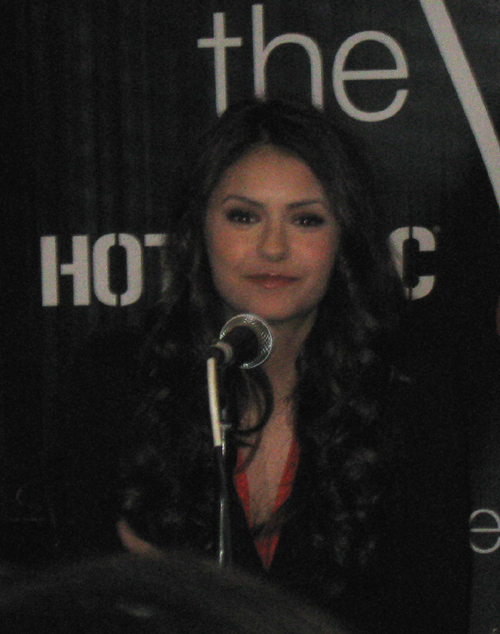 Nina refused to take sides in the fans’ battle over which vampy brother is hotter. 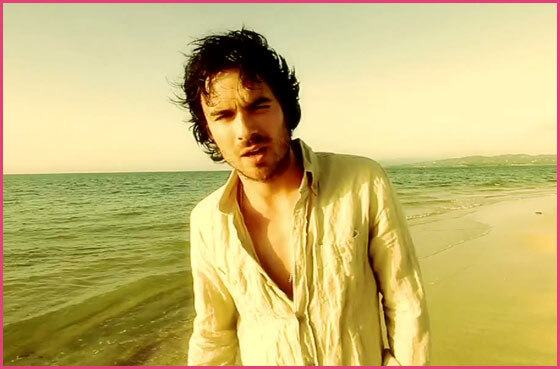 “I am on ‘Team Defan,'” she joked. Before the question-and-answer session ended, I made my way around the corner to the entrance of Urban Outfitters. The actors had come through the store on their way in, so I figured they would leave that way, too. And it’s a good thing I was standing there, because that’s exactly what happened. 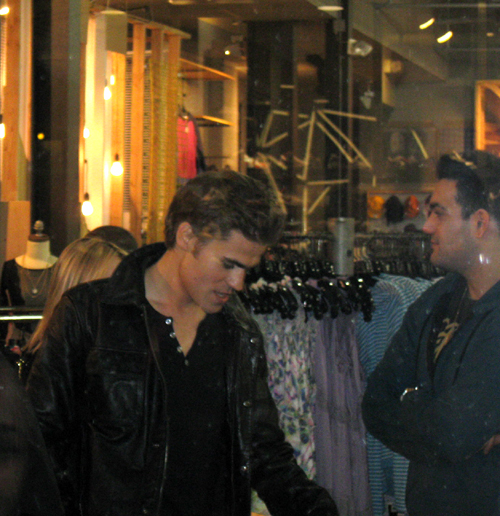 Paul walks through Urban Outfitters on his way out of the event. Paul was the first one through. When fans began tapping on the window, he turned around, smiled and waved hello. Ditto Nina. 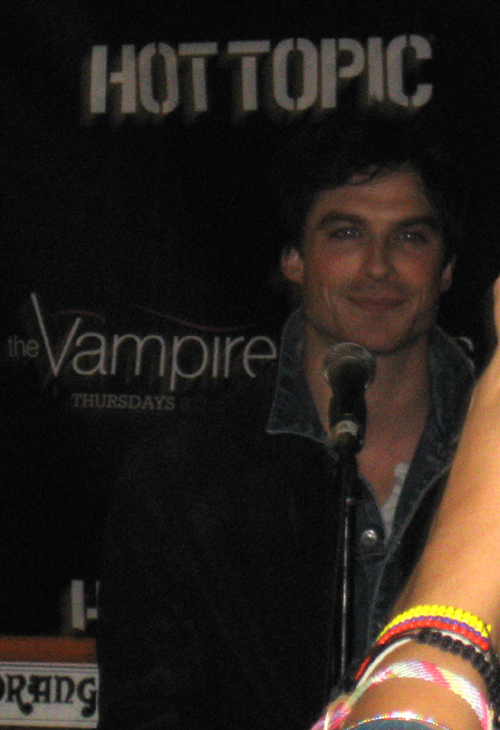 Ian was the last to walk by, but he wasn’t content with just smiling and waving. Oh, no. 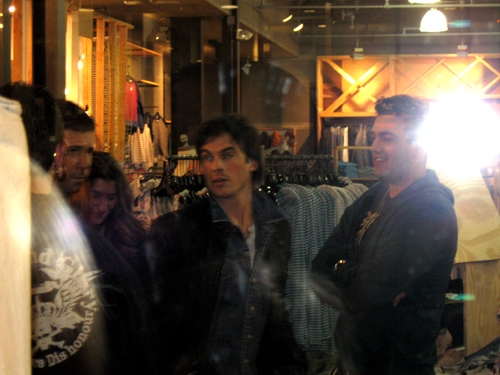 This photo was snapped seconds before Ian got *up close and personal* - albeit through a glass window - with some fans. If it wasn’t already obvious, Ian enjoyed himself thoroughly. “I feel like a Beatle!” he said during the Q&A. A short article about the event is featured in today’s issue of The Record and professional photos are available here and here. In addition, there is an assortment of videos taken by fans on Youtube. The picture quality of this one is particularly good. Enjoy! If anyone was at the Garden State Plaza event and would like to share their stories, photos, or video, please leave a comment! 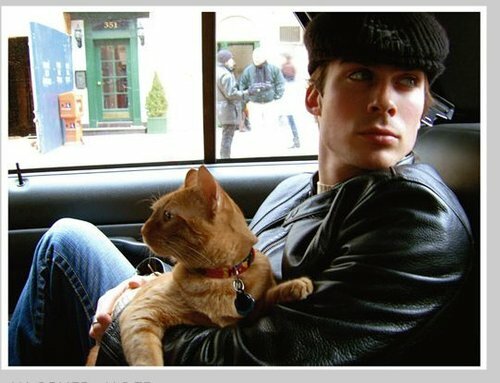 And by the way, I would love to know how Ian got ahold of my cat. 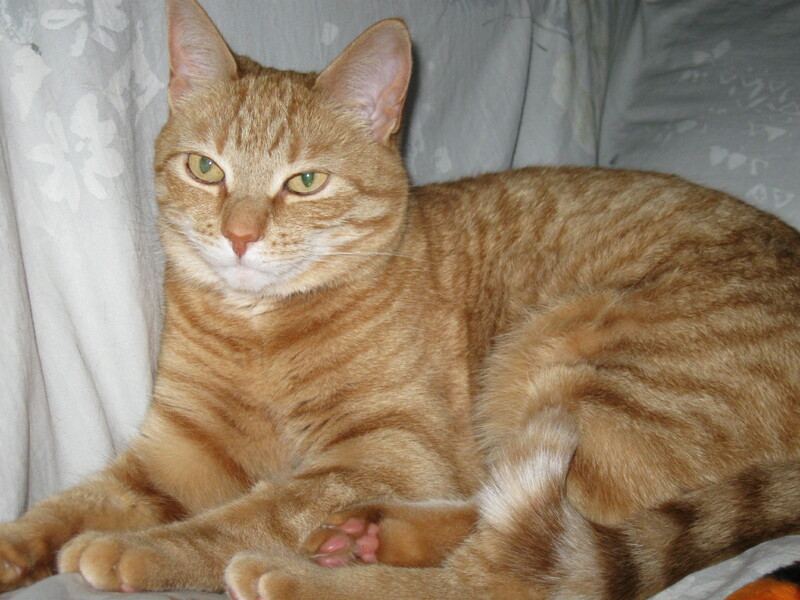 I want Ginger back!